Solar energy uses the sun's radiant heat and light. The conversion of the sun to useful energy for power generation is accomplished thru either thermal or photovoltaic solar systems. The thermal systems harness the sun's radiation and use it as a source of heat that is expanded thru turbine that operates on steam or other working fluids. Photovoltaic cells, on the other hand, convert sunlight directly into electricity using a semiconductor material. The sun is earth’s major source of energy. The potential of solar radiation is enormous and can be used to heat buildings or generate electricity in a clean, efficient and environmentally-benign approach. Most solar energy projects receive grants and/or tax credits to support the economics of the plant and take advantage of the clean attributes of the power generation. The sun is the major source of heat that expands the air and produces wind. We capture this energy trough modern wind turbines. Typical wind turbines drive generators that are connected directly to the shaft of the turbine blades. Wind energy does not produce environmentally-harmful emissions. 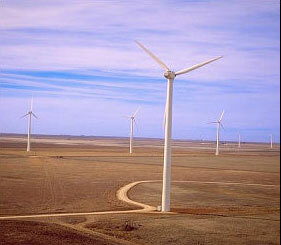 In a typical wind farm there are several wind turbines grouped together. The combination of these wind machines is the best use of the site electric grid infrastructure and provides economies of scale in power production.. This also lowers the environmental impact. In the wind farm (depending on the size) there could be a central building that houses the main controls and provides the location for housing the main interface to the utility grid, storage for spare parts and maintenance shop. While assessing sites for wind it is important that the magnitude of the wind is taken into account as well as the location of the utility grid and its power capacity. Also included is a environmental study so there are minimal impacts to the local terrain and habitat.